When I gave a speech about connecting heritage and food to a group of Norwegian women last spring, one of them said that she wished her 20-something-year-old son would take an interest in Scandinavian cooking like I have. Obviously an important part of her life, the food of her heritage hasn’t yet become a connecting point between the generations. I wish I had a solution for her, a way for her to convince her son to take notice of the richness and memories woven into old recipes and the food served to generations of family members. Until that happens though, I hope the woman makes a point to collect and gather her family’s recipes, writing down memories and stories as she goes. I certainly don’t expect everyone to get as giddy as I do about handwritten recipes and boxes of notecards with ingredient lists in elegant penmanship. But I do know that food is one of the easiest ways to bring people together and prompt connection. It’s a way to carry on traditions and to conjure up memories. I’ve written before about how I have only a few recipes from my late grandmother Agny. Most were lost after she died. The few I have come from old church cookbooks and my other grandma’s collection of recipes. One of my great regrets is that I didn’t join Grandma Agny in the kitchen and bake with her, listening as the process coaxed out stories of life in Norway. It’s a tradition I share with Grandma Adeline and my mom, and one I feel so privileged to get to enjoy. For the last couple of years I’ve been trying to recreate some old cookies that Grandma Agny used to make. Sweet and buttery, with a pleasant, toothsome crunch, the cookies were a staple at Christmastime. All I know is that they were a traditional type of Scandinavian cookie that Grandma shaped in an unconventional way. Formed into parallelograms with horizontal lines pressed into them with the tines of a fork, they were delicate and pretty, and Grandma served them with pride. Many of you have offered ideas for what those cookies could have been, and I’ve been following your leads and baking through recipes in my Scandinavian cookbooks. I’ve come close at times, but I’m not there yet. 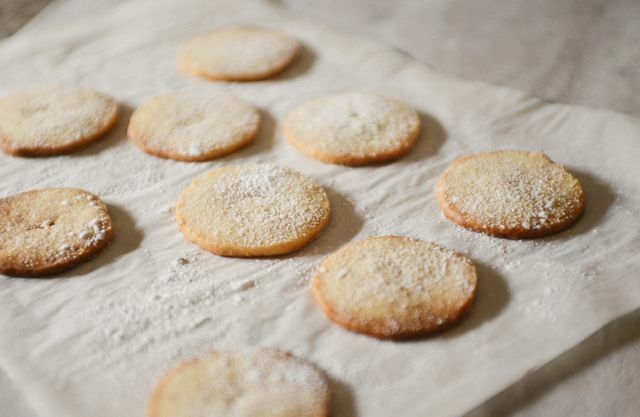 The fun part of the process is discovering cookies that I’ve never made before, including these Danish vanilla cookies. 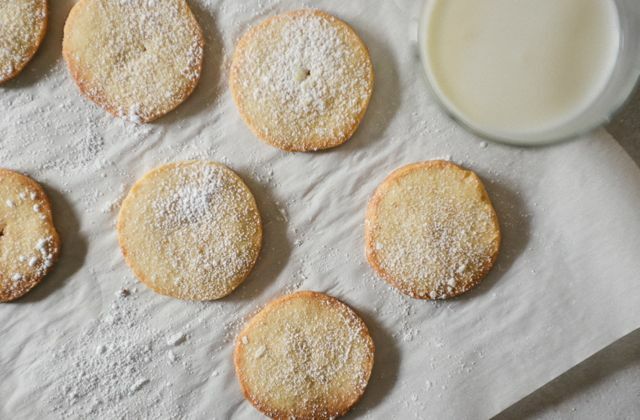 With an easy dough made little more than the normal butter, sugar, flour, egg, and baking powder, they’re flavored generously with vanilla, which lends a rich quality to them that pairs perfectly with a glass of milk. 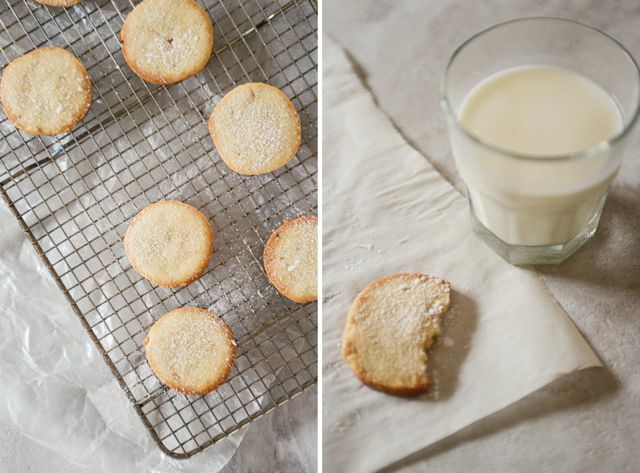 Think sugar cookies with an extra punch of flavor. As I took my first bite, still warm from the oven, I analyzed the flavor, comparing it against the cookies I have filed away in my memory from so long ago. Not quite. These cookies are too crisp, too. I’m encouraged, though: I have a new recipe that I’ll be sure to make again and again, and thanks to the suggestions that some of you have left on my Facebook page since I asked for ideas yesterday, I have plenty of direction for where to take my search next. Cream butter and sugar together in a large mixing bowl until smooth, then add egg and continue beating until the batter is light. Mix in the vanilla extract. Stir together flour and baking powder in a separate bowl, then add to the batter, mixing until all the ingredients combine and form a stiff dough. Turn out the dough onto a work surface and knead briefly, further incorporating the ingredients without overworking them, then separate the dough into two portions and roll each into a log two inches in diameter. Wrap the logs in waxed paper and foil and chill in the refrigerator. At this point you can either wait an hour or so, until the dough is chilled through, or you can wait and just keep the dough in the fridge until you’re in need of some freshly-baked cookies. According to the original recipe, the dough will keep for up to two weeks. 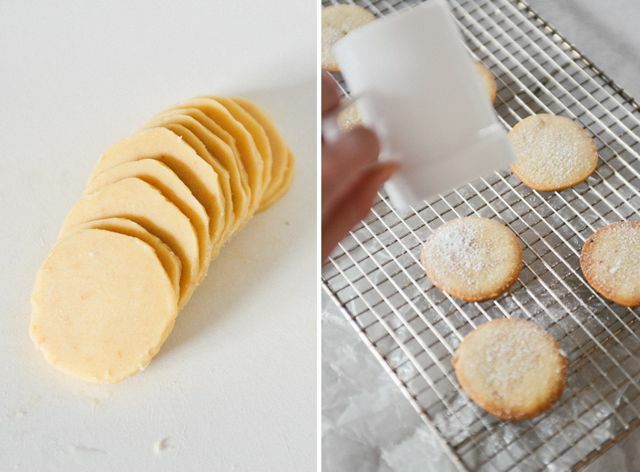 When you’re ready to bake the cookies, preheat the oven to 375 degrees and line baking sheets with parchment paper. Slice the chilled logs into rounds about 1/8-inch thick and place on the prepared baking sheets about an inch apart. Bake in the top third of the oven for about ten minutes, until the tops begin to turn golden around the edges. Allow to cool slightly, then dust with powdered sugar. Try making them with brown sugar, or a half and half mix of brown and white. This will help to soften them up. Charlie – that’s a great idea. I’ll give it a try. Thanks! My great grandmother taught me how to make onion dumplings (that she, in turn, learned to make from a couple Bolshevik soldiers that stayed in her attic during the war when she was a girl…) before she died. It’s a memory that I cherish more and more as the years go by. She always served her dumpling with caraway sauerkraut and I make that myself now, as well. Sarah – Thank you for sharing your story. I hope you do gather your family history and recipes for the rest of your relatives! They would cherish it. I just happened to listen to a podcast where one of Thomas Keller’s pastry chefs said that less sugar gives a softer cookie. I will try this recipe and reduce the sugar but it does sound delicious as is! I stumbled upon your blog by accident and am delighted to have found you. I live a bit north, in Mount Vernon, and am teaching a few classes at the Nordic Heritage Museum. I will be making my first trip to Norway in just a few weeks and found you because of your blog name. Sending you the happiest of wishes! Sharyn – thanks for passing that along. Let me know how the cookie adaptation goes! What classes are you teaching at the museum?